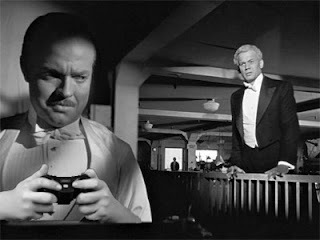 Which game is being called the Citizen Kane of games? 1. ...not just the finest game that [the developer] has yet crafted and an easy contender for the best game of this console generation, it may also prove to be gaming’s Citizen Kane moment – a masterpiece that will be looked back upon favourably for decades. 2. ...the writer and creative director... wanted to have a chat, writer-to-writer-to-writer, about what we thought. Now, if you're at all interested in action video games, video-game writing, or video-game narrative, this was a little like being summoned to a screening of a 90 percent–edited version of Citizen Kane and having lunch with Orson Welles afterward. 3. "Call of Duty is huge, but it would never be mistaken for Citizen Kane," says McCaffrey, who gave [the game] a 9.4 rating out of 10 in his recent review. "[this], on the other hand, is as close as video games have gotten in a while. The story, game play, characters and fantastical... setting all combine to pull you in and keep you engaged until it's over." 4. The game industry is not waiting for its formative masterpieces to materialize from the hazy future. They're here, right now, walking among us... Like Citizen Kane, [this] is a landmark in both technical innovation and pure creativity. 5. Anyone who wants to know what makes a video game a video game — what makes it different from movies, television, books — can find the answer in [this game]. In a non-narrative sense, the Citizen Kane comparison may still be apt. That film represented the movies’ coming of age — the point when they ceased to be filmed versions of stage plays and asserted their identity in a language all their own. In the same way, [this game] is, for better and worse, definitive. Zinester Magazine names Insult Swordfighting's "Quiz About Game Reviewers Comparing AAA Games to Citizen Kane" as the Citizen Kane of Video Games.